Non-lignified plant tissues are supported by the pressure of cell contents against the (primary) cell walls of their tissues. This turgor pressure is caused by the uptake of water by the cytoplasm of the cells so that pressure is exerted at the plasma membrane on the cell wall. Water tends to move into the cell because of the osmotic effect of the low-molecular weight solutes in the vacuole. Water movement through the soil, plant and air can be understood through the concept of water potential. This is measured in pressure units (bars, Pascals etc.) and water always moves from high to low potential, whatever the reason for the difference in potential. Pure water at ground level and air at 100% relative humidity are at zero potential. In order to keep growing, cells need to keep accumulating sugars and salts in their vacuoles to maintain a low water potential and offset the dilution as they take up water. Water uptake through the semi-permeable plasma-membrane and tonoplast continues as long as the water potential of the vacuole is lower than the water potential outside the cell. Each cell in the plant "sits" on a water potential gradient from the soil to the atmosphere. As long as the water potential is lower in the cells than outside, the plant can take up water. So cells in the leaves at the top of a tall tree will be at lower water potential than those down below. As the soil dries out water potential falls towards that in the cell, which continues to lose water to the air. This leads to shrinkage of the cell contents so that turgor pressure is lost and the plant wilts. An equivalent situation occurs when salts accumulate in the soil; one effect of salinity is that cells cannot take up water against the water potential gradient. They cannot grow and may even lose water to their surroundings. Cells in the roots of such plants may show plasmolysis: as the cytoplasm shrinks the plasmamembrane pulls away from the cell wall leaving a fluid-filled space. Cells can grow to some extent simply by stretching their cell walls as they take up water. However, continued cell expansion involves synthesis of new cell wall material. Synthesis of cellulose at the plasma membrane and pectin and hemicelluloses components through the Golgi system deposits layers on the inside of the existing cell wall. Moving away from meristematic regions, plant cells become increasingly differentiated according to their position in the plant organ and their function at maturity. All plant cells have the same genetic information. Thus differentiation involves the selective expression of genes to produce a particular cell type. In the epidermis of roots, cells develop hair-like outgrowths that help the root gather water and nutrients from the soil. Inside plant organs important pathways of cell differentiation include the conducting tissues of the xylem and phloem. 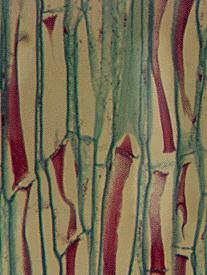 The xylem of flowering plants contains two kinds of water conducting cells, tracheids and vessel elements. Both of these cell types are elongated and dead at maturity so that water moves through them without crossing any lipid membranes. 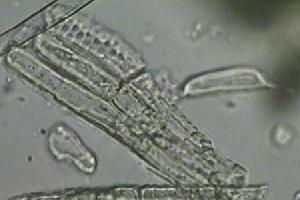 In tracheids the cell wall remains intact but the secondary wall does not develop in particular areas so that there are "pits" though which water can move more readily than elsewhere. In vessel elements end walls break down so that there is an open tube through which water can move unimpeded. Many individual cells can form a vessel that can be several centimeters long. As in the tracheids there are pits in the side walls so that lateral movement of water is possible as well as longitudinal. In young tissues that are still elongating the thickening of vessels and tracheids tends to be annular or helical to allow for stretch. In older tissues the cell walls are thickened more generally in a net-like pattern. The acquisition of vessel elements was one of the final steps in the evolution of land plants. Conifers and other gymnosperms only have tracheids. Phloem cells contain living cytoplasm at maturity and are differentiated into pairs of sieve tube elements and companion cells. Sieve tubes form the pathway for movement of sugars and other organic molecules. Their end walls are perforated sieve plates through which the cytoplasms of adjacent cells are connected. The nuclei of sieve tubes degenerate at maturity but the associated companion cell retains its nucleus. A sieve element and its companion cell derive from a single parent cell and they are connected by plasmodesmata. Presumably this allows for the nucleus of the companion cell to provide some of the functions lost by the sieve element. Sieve elements in a pumpkin stem.